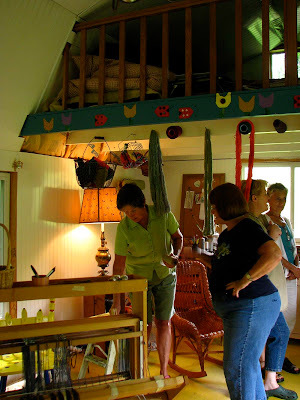 Thank you Barb for having our wandering weavers out to your beautiful valley home and to see what you have been up to in your studio; pictured below. 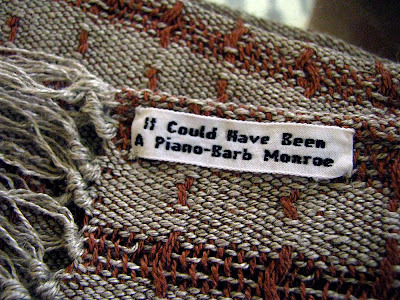 Your labels crack me up and I know you made the right decision when you were trying to decide between learning to play the piano or how to weave. 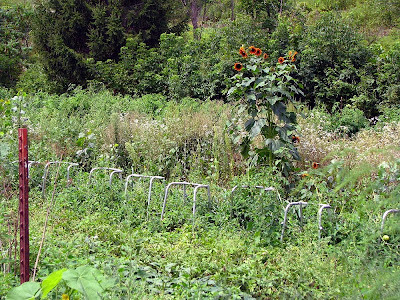 Barb’s husband Harry is an avid gardener however the walkers as tomato cages just cracked me up. Just in case the tomato’s decide to go for a stroll? 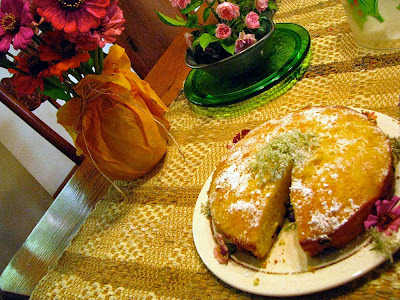 Scrumptious cake by Joanne paired well with Barb’s summery corn salad. 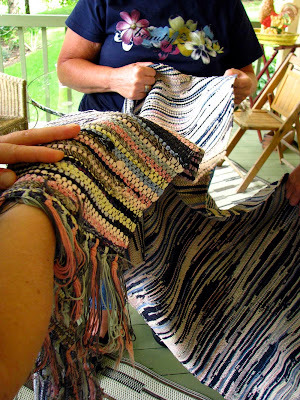 Elin showed off a couple of old well worn rag rugs. Impressive to see how they have lasted throughout their long lives. I hope mine last as long. 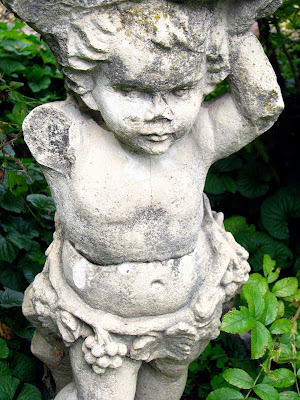 And that at some point a new weaver looks at my weaving in wonderment and finds some inspiration. 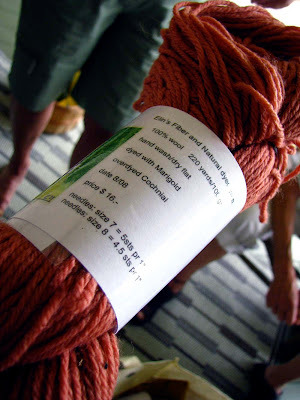 We all oohed and awed at Elins’ naturally dyed yarns and look forward to our next meeting, when she has invited us to do some natural dyeing, out at her farm. 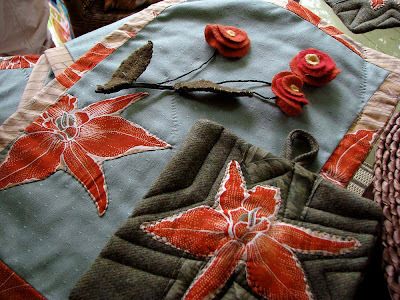 Joanne created a wonderful wedding gift set of placemats and wool potholders with a stem of wool posies to tie into the gift wrapping. Just lovely. 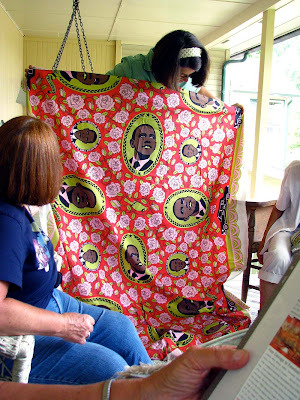 Susan’s fabric was a calliope of color that I believe she said was gifted to her by a friend. I doubt that she will be cutting this one up for rags, although I must admit the colors would make me tempted. her house looks like such a great place to visit! 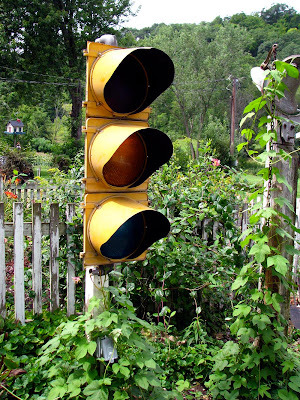 I love the traffic light and the walkers, so funny!